OEDA members employ nearly 4,000 Ohio workers and generate nearly $2 billion in annual sales volume. Most member companies are family-owned, and nearly a third are in their second or third generation of ownership. OEDA members provide the equipment, parts and service expertise to help contractors maintain and improve Ohio ’s massive public works infrastructure that includes more than 116,200 miles of highways, roads and streets, 42,000 bridges and a million miles of water, sewer, energy, and telecommunication lines. OEDA members are key players in the modernization and expansion of pipelines and treatment facilities to prevent the overflow of untreated sewage into waterways. OEDA members provide energy-efficient, state-of-the-art construction and material handling equipment for Ohio ’s housing market, educational institutions, retail, commercial and industrial facilities. OEDA members are a vital link in the construction of Ohio ’s “Third Frontier” initiative to build a statewide broadband high-speed data network. OEDA members help ensure the health of Ohio ’s economy and continued strength in all sectors – education, consumer, landscaping, business, manufacturing and industrial. CONSTRUCTION: A VITAL PART OF OUR ECONOMY! Total construction spending in US – nearly $1 trillion! Value of construction machinery shipments from US manufacturers – more than $12 billon annually! Construction vehicles operating in the US – 2.5 millon! Anticipated need for new technicians through 2012 – 4,000 annually! The Ohio Equipment Distributors Association (OEDA) was officially launched on June 1, 1946, with 19 charter members. 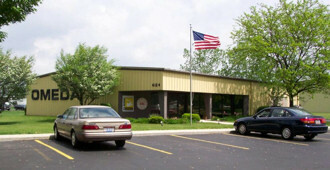 OEDA, an organization of construction and industrial equipment distributors, was formed "to foster and extend good relationships between construction equipment dealers; encourage wise and needful legislation, regulations and trade practices; foster manufacturer-dealer relationships in cooperation with other trade groups; to collect and disseminate information among the members; to promote necessary and useful construction; and to support the Associated Equipment Distributors." In a marketing tool from 1952, then Executive Secretary Kenneth Dinsmore wrote, "The Association is at present the best medium in which to express a general need collectively, and only by being associated can one contribute to any such movement." We couldn't say it better today. A renewed interest in a unified voice for distributors took place with the advent of the interstate highways in Ohio. During this time, OEDA turned its primary focus to addressing the increased equipment needs and labor challenges associated with the fast-paced, demanding construction schedule of the interstate highway system. Over time, OEDA's mission statement evolved into its current form: "To keep its members abreast of the latest development in the industry, work shoulder-to-shoulder with other trade associations in the construction industry to promote more work for the contractor, and to work in close harmony with the Associated Equipment Distributors to provide a constant flow of ideas between companies engaged in a common industry." In 1987, OEDA's leadership saw the need for a stronger voice in legislative matters and better information dissemination on regulatory issues. Following a thorough investigation, the OEDA Board of Directors contracted with the FPER Association (now the Ohio-Michigan Equipment Dealers Association) to provide administrative services. With the additional member services, increased legislative efforts, and a full-time association staff working on its behalf, OEDA flourished and grew by leaps and bounds. Today, true to its founding ideals, OEDA continues to be the voice of Ohio's construction and industrial equipment distributors.